Quality all steel construction from 1-1/2" x 1/4" steel slats provides a rugged durable receptacle ready for high volume use. 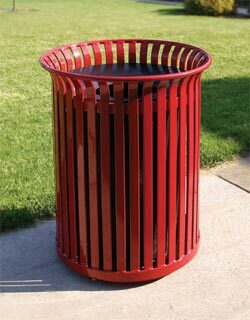 The unique weather-resistant corrosion protection finishing process of the Metal-ArmorSM coating protects these trash receptacles and keeps them looking vibrant for many years to come. The receptacle ships ready to use out of the box, no assembly is required. Powder-coated lid is available in the colors as shown.